1867-1873 autograph album that belonged to an Ella, perhaps Ella Morris Dorsheimer, of St. Louis, Missouri. Many of the autographs are inscribed to Ella; one of the group pages contains the autograph of Ella Dorsheimer, who signed her name and the date, August 19, 1869. 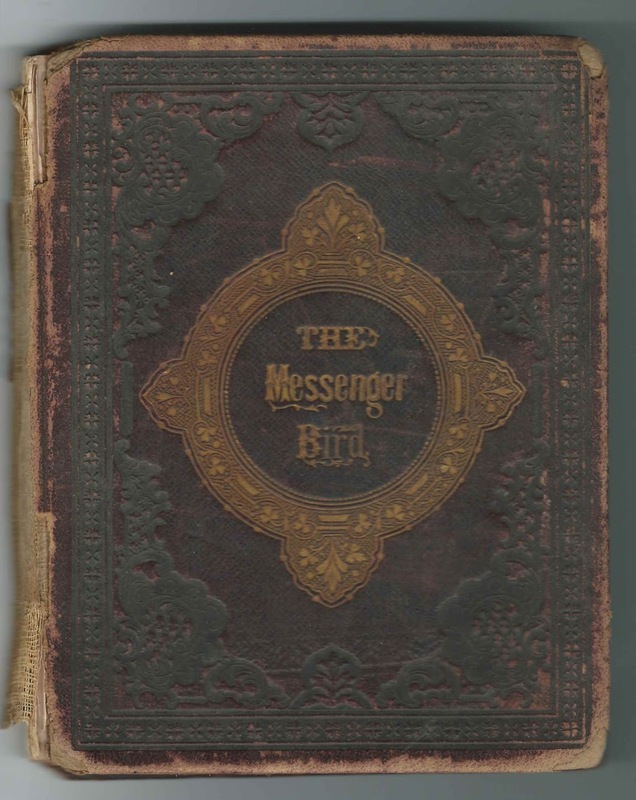 The album, published by Leavitt & Allen of New York, New York, measures approximately 7" x 5-1/4" and contains four engravings and the sentiments of 80 people, though a few of them may have signed more than once. An alphabetical surname list and an alphabetical list of the signers, together with any personal information they offered, appear at the end of this post. One of the group pages mentions that the signers were members of the Junior Class. Ella Morris Dorsheimer was born December 27, 1851 at Saint Louis, Missouri, the daughter of Col. Lewis Dorsheimer and Eugenia D. (Close) Dorsheimer, who were born in Pennsylvania and New York, respectively. Lewis was a merchant, and the family was apparently well off, as I didn't see that Ella had an occupation in Census records, and one of them listed her widowed mother's occupation as "Own Income". I don't believe Ella ever married. She died in 1920. Several signers inscribed more than one page, I believe, though some of the additional pages were surnames only or initials and a surname, so I can't be sure. I believe that Henry Franklin Deane signed three pages. And two people named Parrott signed more than one page. There's a calling card inside, very faded, but I believe the name was T. J. Parrott. Several pages were signed by Rob C. Parrott, assuming he was the R. C. Parrott who signed. One signer, named Brolaski, who inscribed a page at Saint Louis, Missouri, in 1867, had me using a mirror to decipher the handwriting. Hotel Johnny; shared the page with O. Robison; Mark LeBron; Sallie J. Peyton; "Shoo Fly"; E. C. Keevil; J. W. McDowell; and R.C.P., K.K.K. "Shoo Fly"; shared the page with Hotel Johnny; O. Robison; Mark LeBron; Sallie J. Peyton; E. C. Keevil; J. W. McDowell; and R.C.P., K.K.K. The Pastor at Trinity Chapel B.T.S. Theo Darling or Thomas Darling; not sure of given name. E. C. Keevil; shared the page with Hotel Johnny; O. Robison; Mark LeBron; Sallie J. Peyton; "Shoo Fly"; J. W. McDowell; and R.C.P., K.K.K. Mark LeBron, signed on April 13, 1871; shared the page with Hotel Johnny; O. Robison; Sallie J. Peyton; "Shoo Fly"; E. C. Keevil; J. W. McDowell; and R.C.P., K.K.K. J. W. McDowell, signed on January 1, 1870; shared the page with Hotel Johnny; O. Robison; Mark LeBron; Sallie J. Peyton; "Shoo Fly"; E. C. Keevil; and R.C.P., K.K.K. 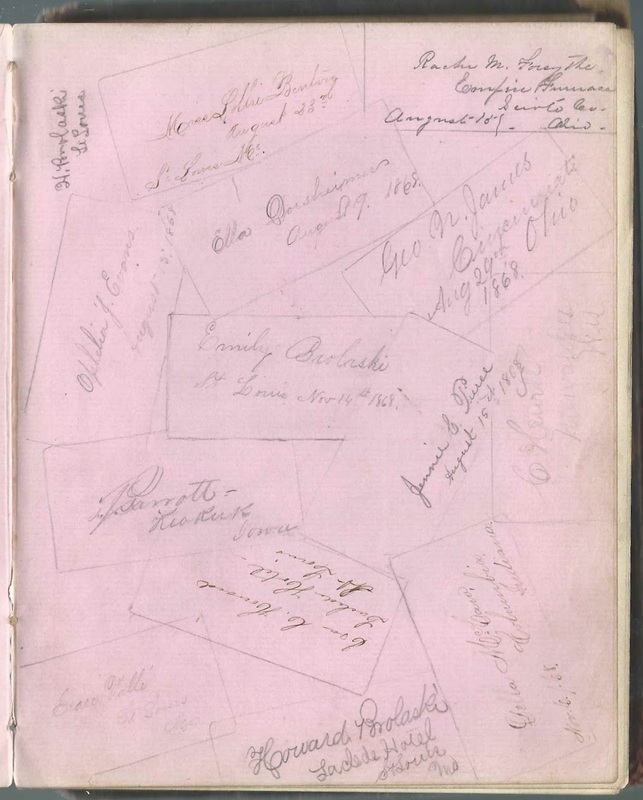 R. C. Parrott; Rob C. Parrott; signed another page as well, and a group page. Calling card of T. J. Parrott of Keokuk, Iowa. Other wording too faint to read. Sallie J. Peyton of Portsmouth, Ohio; shared the page with Hotel Johnny; O. Robison; Mark LeBron; "Shoo Fly"; E. C. Keevil; J. W. McDowell; and R.C.P., K.K.K. O. Robison, signed on December 3, 1869; shared the page with Hotel Johnny; Mark LeBron; Sallie J. Peyton; "Shoo Fly"; E. C. Keevil; J. W. McDowell; and R.C.P., K.K.K.